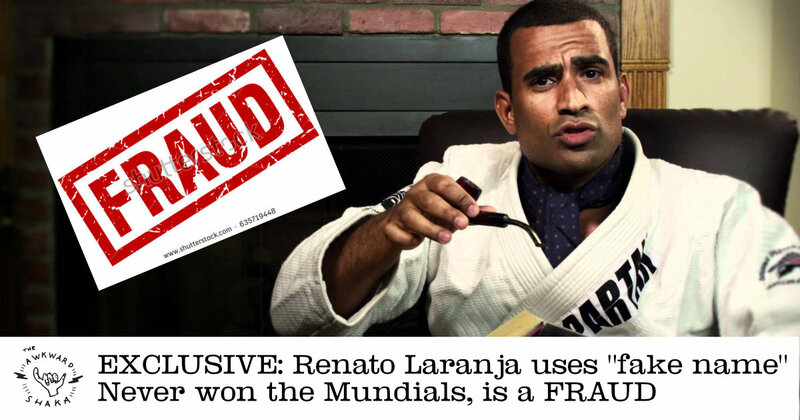 Renato Laranja, one of the most beloved figures in modern Brazilian Jiu Jitsu, may well have duped the entire jiu jitsu community. The Awkward Shaka can confirm that many of his claims are outright false, and he is in fact an actor from New Jersey whose real name is Ted Kramer. The IBJJF World Championships started in 1996, exactly 22 years ago, therefore this claim is a LIE. Also, that would mean that Laranja began competing and winning in the adult division as a child, which is highly unlikely. It is unclear where Renato got his black belt from, some say Eddie Bravo, some say he gave it to himself as a reward after masturbating for 17 hours straight, in any case, 10 stripes on a black belt simply does not exist and is therefore fraudulent. Also, Eddie Bravo never trained in the gi so he cannot give out a black belt (FACT). Ted Kramer has never had a girlfriend let alone a child and does not pay child support, our sources can reveal. The one thing our sources cannot reveal is whether or not so-called Renato is Brazilian. The Brazilian accent is 100% authentic and perfect and could not possibly be fake, therefore we are still investigating whether Ted Kramer is in fact a Brazilian immigrant to the USA. Porra. Not sure if stupidity or irony.